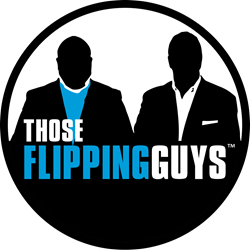 Professional property flippers, Gene Schroeder and Angelo D’Alessandro, known as Those Flipping Guys, will host a free webinar on ThoseFlippingGuys.com on August 2, 2017. It’s not just about the money with you flipping guys… you really care about doing the right thing. The webinar event is tailored to suit both beginner real estate investors and experienced flipping professionals. Those Flipping Guys will share real-world examples through experience, give advice, and answer questions in real time. The webinar will cover industry case studies, tips, trends, and common mistakes in real estate flipping. With additional experience in rental units for their long-term portfolio, Those Flipping Guys can answer questions relating to quick flips or big picture investments. Viewers are invited to ask questions during this live event. Schroeder and D’Alessandro will speak on actual strategies and properties they are currently flipping, renting, or investing. This team is known as two local success stories with their reality show on YouTube and star in Flipping Wars on A&E. Schroeder and D’Alessandro have been working together since 2001 when they created Reef Properties, LLC. In 2003, they formed an energetic and team oriented real estate buying and selling group called Bank On It!. The team flips between 10-15 properties per month which include apartments, homes, condominiums, and land plots. Schroeder has 20 years of experience in the real estate industry when he began buying and selling Florida properties in 1997. He specializes in wholesale, but has also seen success with rehab projects, rentals, and hard money deals. He is a graduate of Florida State University and has volunteered his time with non-profits and helping young businesses grow. D’Alessandro comes from a slightly different background, working with financial planning and insurance before finding his passion with real estate. He runs the Helping Kids Broward program, which brings clothes, food, and gifts to schools in Southern Florida. He is a graduate of the University of Florida and has worked with big names in the real estate industry. Those Flipping Guys combine professional experiences and people skills to succeed and connect within the industry. Signing up only requires your name and an email address. More information about their webinars can be found on their website.